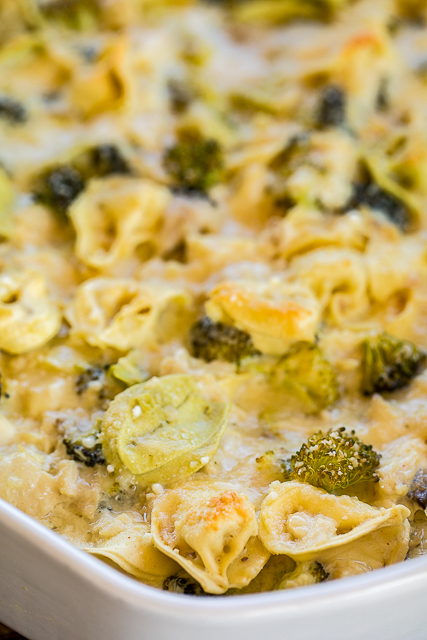 Chicken and Broccoli Tortellini Casserole - comfort food at its best! Chicken, broccoli and tortellini tossed in a quick white sauce and topped with parmesan cheese. The whole family cleaned their plate! Even our picky eaters!! Chicken, broccoli, tortellini, butter, flour, garlic, chicken broth, half-and-half, onion and red pepper. Can make ahead and freeze for later. Great easy weeknight dinner casserole recipe! 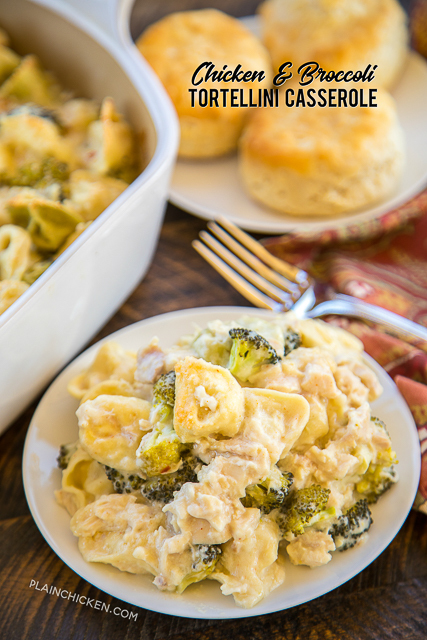 This Chicken & Broccoli Tortellini Casserole is fantastic! Chicken, broccoli and tortellini tossed in a quick white sauce. YUM! We ate this for dinner and leftover for lunch the next day. SO good. We aren't even big broccoli fans and we loved this yummy casserole. This is comfort food at its best! 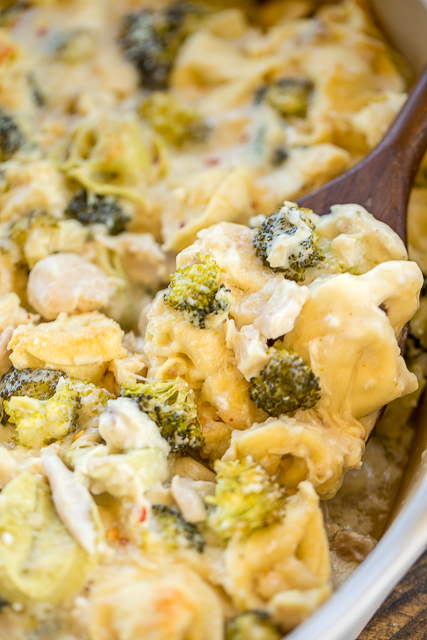 This Chicken and Broccoli Tortellini Casserole is very easy to make. You are going to start with making a quick white sauce/béchamel. It sounds hard, but it is very simple. Melt butter in a pan and add some flour and garlic. Whisk it until smooth. Next you are going to slowly whisk in the liquids. I do this a little at a time and whisk thoroughly before adding more liquid. This will ensure you don't have any lumps. Remove the sauce from the heat and stir in the spices and cheese. After the sauce is done, just toss it together with some fresh broccoli, cheese tortellini and chicken. Spread in the pan and you are ready to bake. Just a note - you don't pre-cook the tortellini in this dish. The tortellini will cook as the casserole bakes in the oven. To cut down on the prep time, I suggest using rotisserie chicken for the cooked chicken in this recipe. You will need a whole chicken. I like the ones from Costco best, but any rotisserie chicken will work great! Can I freeze Chicken and Broccoli Tortellini Casserole? 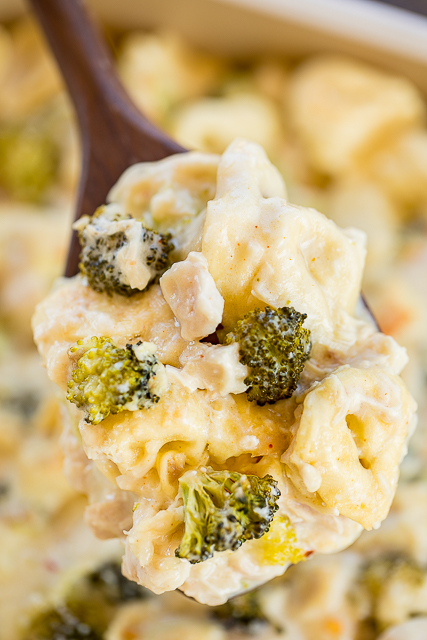 This Chicken & Broccoli Tortellini Casserole is a great make ahead/freezer meal. This makes a lot, so you can split the casserole between two pans. Bake one now and freeze one for later. High five for easy weeknight meals!! This is really a whole meal in one pan. We just served this with some biscuits. Comfort food at its best! Can't wait to dig into this again soon! Melt butter in a Dutch oven over medium-high heat. Add flour, stirring until smooth. Add garlic and cook an additional 30 seconds. Slowly whisk in broth and half-and-half. Reduce heat to medium and cook, stirring constantly, until thickened. About 6 minutes. Remove from heat. Stir in 1 cup of Parmesan, onion salt and red pepper. Stir until cheese has melted. Stir in pasta, chicken and broccoli. Spread into prepared pan. Top with remaining 1/2 cup of Parmesan cheese. Bake uncovered for 40 to 45 minutes. Can make in advance and freeze unbaked for later. To bake after frozen, thaw completely and bake as directed above. Did you use fresh or frozen Broc? Do you pre cook the fresh Broc, or thaw the frozen first? I used fresh broccoli and did not cook it. It cooks with the casserole. Enjoy! Do you think this could be prepared and frozen prior to baking? I ended up cooking the minced garlic in the butter before adding the flour to make the roux, but the directions didn’t specifically say when you added it.